The following shows how forwarders threaten a server’s reputation and cause rejected messages. Many users configure email to a single mailbox. This is not only convenient, but it is what many have done for years. Now things have changed. Today, the major free email service providers are blocking any server that sends spam or does not follow the DMARC Guidelines. 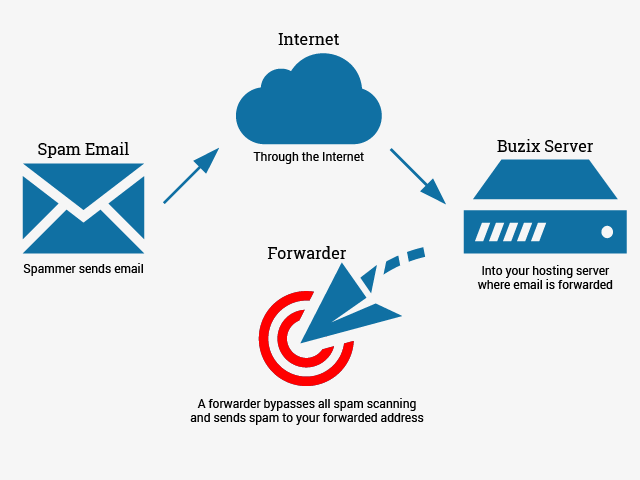 Forwarders pose a threat to all domain hosting servers that do not conform to these policies set by email service providers. There is no way to filter forwardersin cPanel. Spam just gets sent blindly through the server to vigilant service providers who block the sending server if they find any spam or errors in the message. To make sure the email works properly for all our customers we ask you not use forwarders that go to external email boxes. Freely forward your email to your own local domain or domains on the same server. For example, a reseller may have mail forwarded from one domain to another as all domains are on the same server. Create a new cPanel email box to replace the forw arder. Use your email client or webmail on the server. Alternatively, configure POP3 or IMAP connections directly through your external email provider. Lease a VPS server to avoid any shared server restrictions and forward emails outside of the server.